This is last weekend for the Coyotes U11 boys and girls team who will close out their season with tournaments on Saturday. Please be on the look out for an invitation to our end of season party in the next couple of days. Finally, come watch some Friday night lacrosse! The boys high school championship between Sacred Heart School and Menlo School will be played at BHS at 7pm this Friday night. Come out and support some Coyote Alums and wear your Coyotes swag! Peninsula Free Spring FUNdamentalLacrosse Clinics Atherton FUNdamental Free Clinic Session 2 (Sunday 2pm-3pm) May 15th. Click here for more info. Season End Party! Save the date for June 5th early evening. There will be fun activities for the whole family. Save your USED lax gear! We will be collecting your lax gear at the season end party! All gear will be donated to a sponsored Bay area LAX program in need of gear! 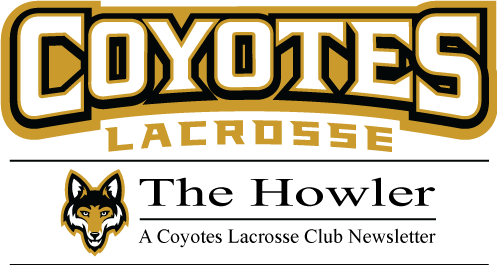 Coyotes 2016-2017 Registration: Registration for Fall 2016 and Spring Lacrosse is coming soon! We will have registration for returning players and then we will open up registration to new players. This early registration process will provide us with more insight and planning support to manage our club size and staffing for the upcoming season.